Oyster E-Book Subscription App: NetFlix of E-Books? As an avid reader, last night, I downloaded Oyster, the subscription book service app to my iPad, just to check it out. There are many times when I read a book, I am not necessarily interested in purchasing a copy, but would still like to read it in e-book format. Some are calling Oyster the Netflix of e-books, and upon opening the app, I was pleasantly surprised by the number of books available. I even found the titles of several books on my reading list that I’ve been planning to read. 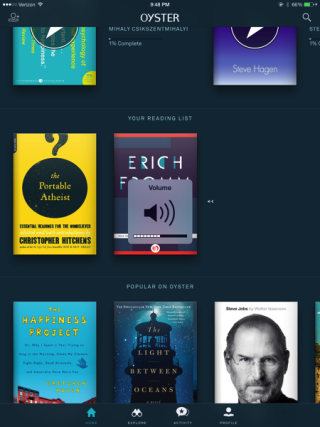 Oyster, gives you access to book titles for a monthly subscription fee of $9.95. Right now, I am using a trial of the service, so I am personally undecided whether or not it’s worth my while to pay the month fee. It also remains to be seen whether the e-book service can provide access to an increasing number of titles, but the idea is appealing, especially to someone like me who enjoys access to a book any way I can get it. Oyster Interface For more information about Oyster E-book subscription service, check out their web site. Apps are available for both iOS and Android devices.